"In time, perhaps, we will mark the memory of September 11 in stone and metal, something we can show children as yet unborn to help them understand what happened on this minute and on this day. But for those of us who lived through these events, the only marker we will ever need is the tick of a clock at the 46th minute of the eighth hour of the 11th day." While it may seem to some that the events of 9/11 recede further into the past with each passing day, for those who lost someone close or otherwise experienced that day – whether in person or on television – thinking and talking about 9/11 may still evoke strong emotions that transport them back to the tragedy and can jar emotions long forgotten. Between managing these difficult emotions and conveying the details of such a tragic event, discussing 9/11 isn’t an easy task. Discussions of September 11th will naturally raise complex questions and may also trigger strong and even unfamiliar feelings. While demonstrating the worst of human nature and the capacity for hateful ideologies to lead to extreme acts of violence and inhumanity, September 11th also revealed the profound human capacity to care for one another and to recognize our common humanity in acts of spontaneous generosity and response, transcending differences of race, nationality, religion, economic strata, and political affiliation. Throughout the district, teachers may have age-appropriate conversations with students focused on providing opportunities for our students to make meaningful and purposeful connections between the history of 9/11 and their own lives, as well as ensuring that our students have access to accurate information about 9/11. For information on how to talk to children about 9/11, click on this link: http://www.911memorial.org/talk-children-about-911. On September 17, 1787, the delegates to the Constitutional Convention met for the last time to sign the document they had created. 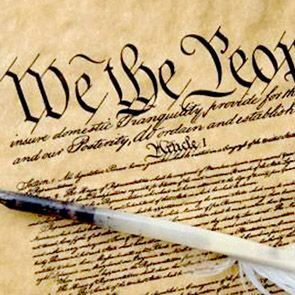 Constitution Day and Citizenship Day celebrates this important day in our nation's history. On this day we commemorate the creation and signing of the supreme law of the land and to honor and celebrate the privileges and responsibilities of U.S. citizenship for both native-born and naturalized citizens. For the fourth year in a row, High School East Social Studies teacher, Cynthia Cullen took the lead on creating a service learning project for all Half Hollow Hills students. Based on a challenge created by the Students Rebuild organization, all students from pre-K through grade 12 participated in the Facing Difference Challenge which helps educators worldwide empower young people to reflect and take action toward building understanding, empathy, and peace. This year, students were asked to create a meaningful self-portrait that reflected their sense of identity. For each portrait submitted the Bezos Family Foundation pledged to donate money to Students Rebuild. Working with students at High School East, along with her colleagues, Jessica Nolan and Allison Uttendorfer, Mrs. Cullen created lessons to be shared with students so that they could further their understanding of what it means to be kind and empathetic. Students participated in lessons and then created self-portraits. At High School West, teachers Carol Lislevatn and Michael Stein led our service learning efforts. In total, Half Hollow Hills students made 21,509 portraits! Our submission to Students Rebuild resulted in $126,723 being donated to CARE and Search for Common Ground, organizations that help youth on different sides of conflict build peace. Tonight, we recognize the students who helped in this tremendous effort. Students from our 201 Senior Experience classes participated in our first annual Senior Experience Internship Celebration. The students presented to their peers, their mentors, parents, administrators and to the Senior Experience Class of 2019. Following the celebration students from both East and West once again created a Field of Honor at Central Office, planting U.S. flags in a solemn formation on the front lawn to honor our military, veterans and first responders who have struggled through our nation’s history to protect and defend our nation. Joan Trumpauer Mulholland, a civil rights activist and Freedom Rider, once again presented on her experiences taking part in sit-ins and being the first white student to attend Tougaloo College in Jackson Mississippi. All of our 8th grade students were amazed to hear her firsthand account of participating in the Woolworth lunch counter sit-in in May of 1963 and about the summer she spent in the Parchman Penitentiary at the age of 19.